How funny is this? 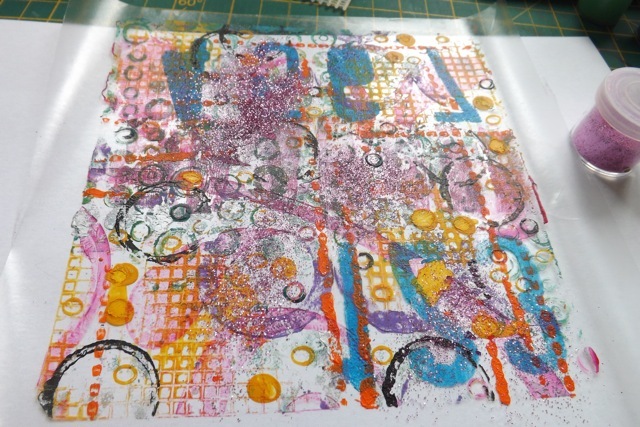 I was playing with my Gelli plate, after a long time away from it, and doing the packing tape thing. I tried sticker paper (too dull) and while I had the Mac shut down (still power issues and the electrician is not available till tomorrow AM – argh!) I was playing with contact paper. leida (a commenter) suggested shelf paper and I realized that shelf paper and contact paper are (I think!) the same thing. My experiments began with pulling the prints with the sticky side of the contact paper (I have a HUGE roll of it) but soon branched out. Remember I had shown embossing on thick card and using that as a texture tool? 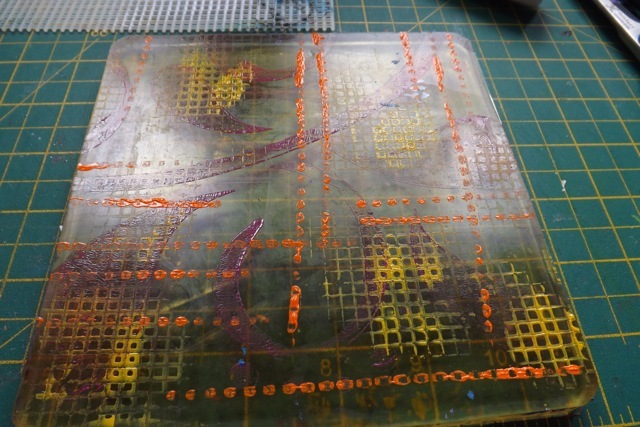 Well, one thing I had done, but not sure I ever mentioned here, was to emboss an old plastic place mat to use the same way. I liked that because it is washable, but I only had a couple and use then for a few things. 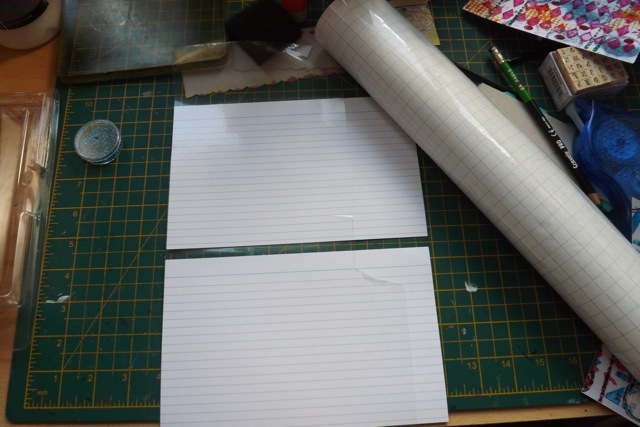 It occurred to me that index cards covered with contact paper could work the same. They do. 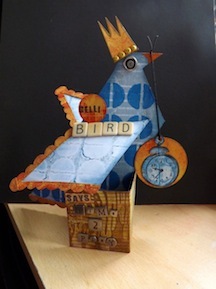 You can either press onto the plate to texture it or brayer paint onto the raised surface and press that onto the plate. Either way, it wipes clean with a baby wipe. 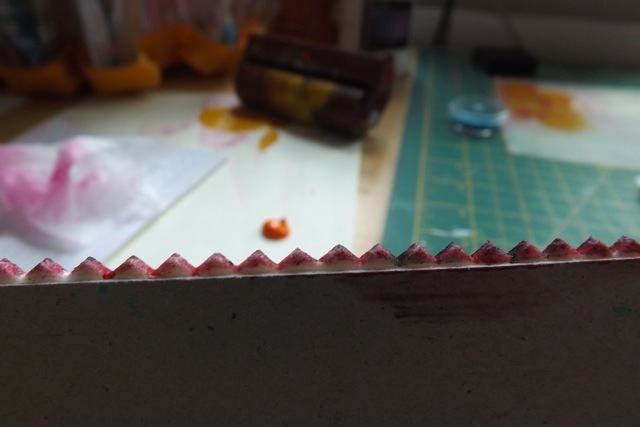 Another thing I discovered was a different use for that foam tool – the one with a strip of pinking-shear cut fun foam between two bits of card? 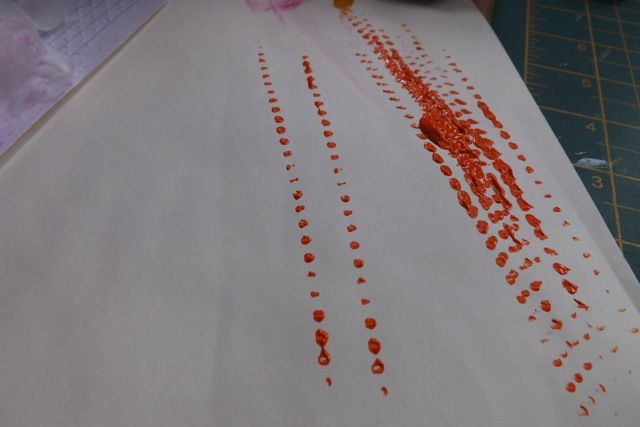 How cool are the thick dotty lines you get with it used as a stamp? The contact paper does pull a great print, as good as the packing tape. And rather than adding foil flakes, I had a go adding glitter. 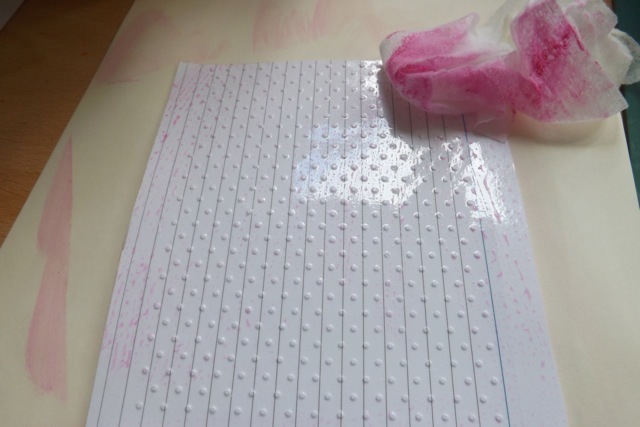 As long as you are sparing with it, the contact paper still sticks – although a layer of gel medium to on whatever you want to stick it to will help if you get too heavy-handed. I really like this one! I have an idea for something using this style of print. but need to work one or two things out. You may be able to tell that for this one I added the first layer of the paint thru a stencil (the diamonds) which gave me plenty of open areas (this technique requires that) I think I prefer that to the deli paper masks. Oh and the Kool Aid hair dye? Rubbish on dark hair. Or 4 hours wasn’t enough. Luckily I had a can of foam mousse (from ages ago when DS did his hair for Red Nose day) and DD was happy enough with that. It says last for up to 8 shampoos, but after this morning’s shower it was very faded. I doubt it will last thru another day, let alone the week! 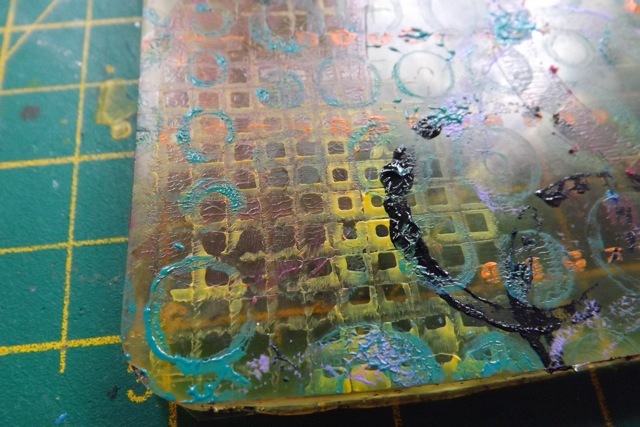 Categories: art, Gelli plate monoprints, tutorial | Tags: art techniques, Gelli plate, how-to | Permalink. Thanks so much for these brilliant ideas! What background are you referring to?? Really liked your embossed re-useable texture plates. 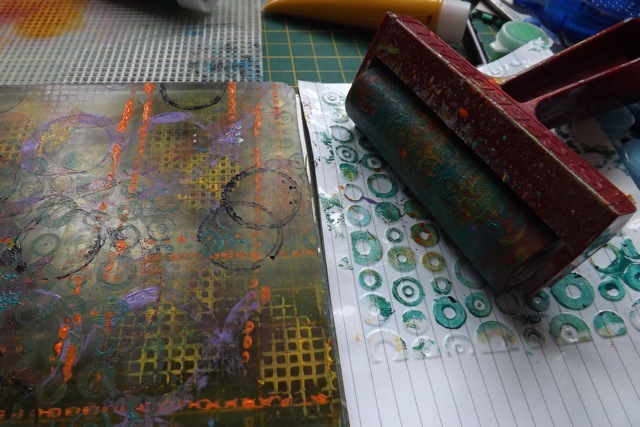 I have so many embossing folders but don’t want to let my students muck them up with paint. 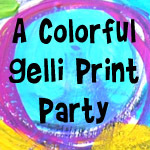 I will have my students make their own to keep and to use on the Gelli plates. Brilliant! These ideas are just brilliant! Your play led to such great tool ideas! Love how you made all sorts of marks! So glad you shared this with the party! What an awesome post, thanks so much for sharing. 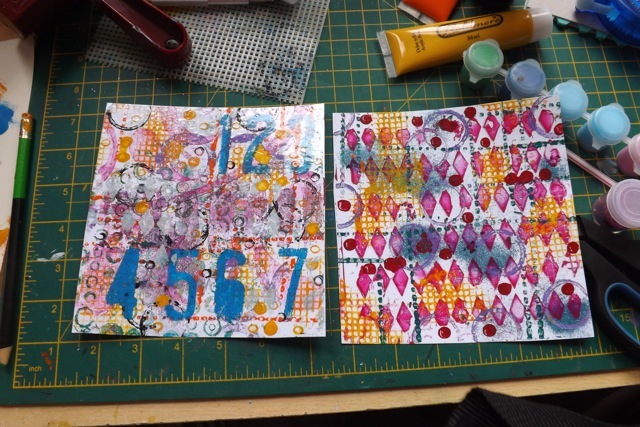 I have to give this gelli plate and contact paper a try. Thank you so much for sharing. I will watch the video again to see how it is done. 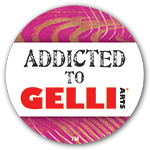 The best place to begin is to check out the Gelli Arts blog and YouTube channel. The videos are really informative and tell you all you need to know. 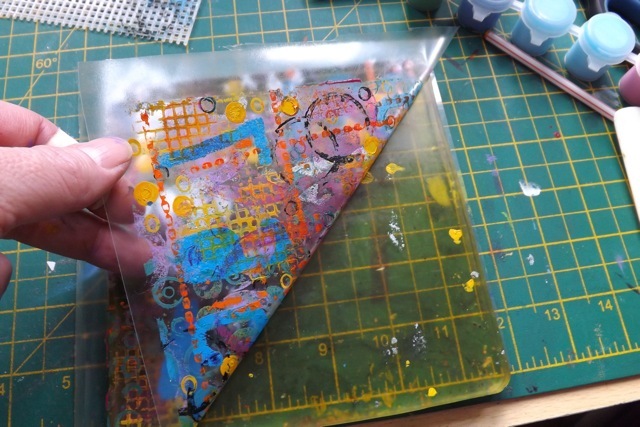 The beauty of the Gelli plat for THIS is you want the paint (acrylic paint) to dry between layers AND before you try to pull it off the plate with the packing tape or contact paper. Pigment ink will stain the gel of the plate. 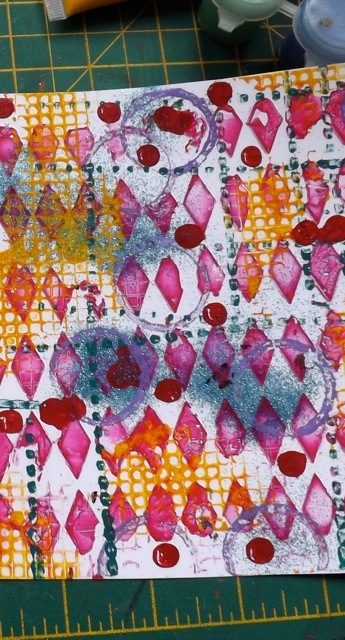 I think if yo wanted to pull a print on PAPER you could then emboss it, as the paint would be wet. With the paint dry, I am not sure that you could. 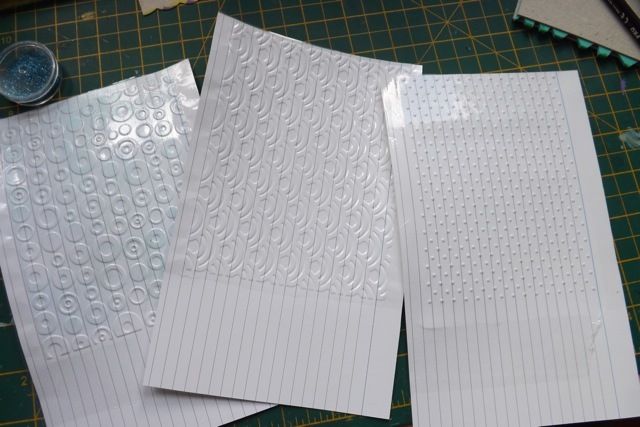 I think the embossing powder would stick to the sticky back of the contact paper but I don’t know what the heat gun would do to it if you then heat embossed what was stuck in the open areas – maybe something to try. So long as you kept the gun moving, it might work. Okay, I understand now! I couldn’t understand until you explained that the paints should be dry before the lift. 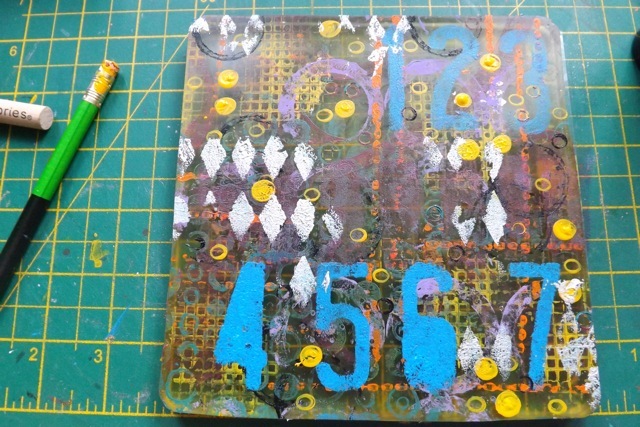 I have made my own gelli plate, but may check out purchasing the original one. Thanks, MaryAnne!